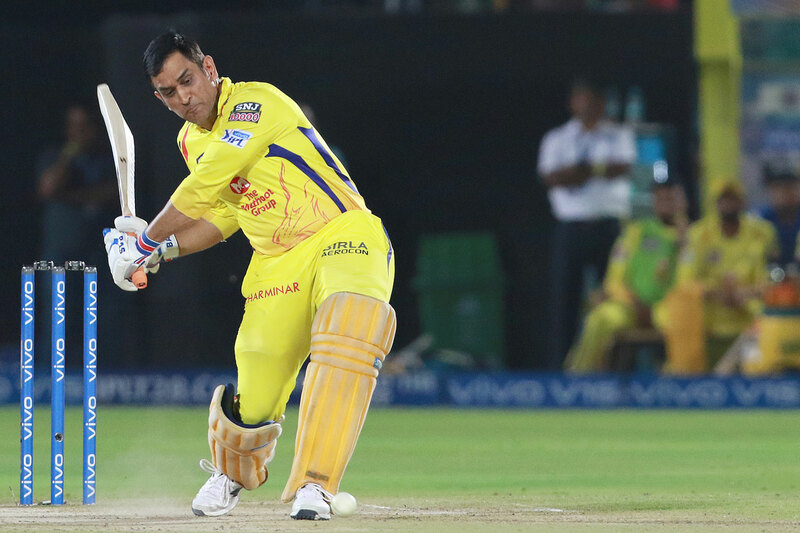 's dramatic last-ball six capped Chennai Super Kings' fourth successful chase of the season, and sixth win overall, as the visitors recovered from a massive hole at 24 for 4 in the Powerplay to pull off a chaotic four-wicket win over Rajasthan Royals. Ben Stokes was tasked with 17 to defend off the final over but just as he had famously fallen short against Carlos Brathwaite in the final of the 2016 T20 World Cup, he was outdone again by a combination of , and Santner. Jadeja slapped an off-balance six off the first ball of the over before Stokes overstepped on the next ball to create a free hit for Dhoni. Stokes bounced back with a slower ball for two before bowling Dhoni with a yorker on the third legal ball of the over. Santner's final-ball heroics wound up erasing a minor controversy that brewed after the fourth legal delivery of the over. Standing umpire Ulhas Gandhe clearly signaled with his arm for a no-ball after Stokes delivered a full toss well over waist height to Santner but then rescinded his call, prompting Dhoni to charge onto the pitch to remonstrate with both Gandhe and leg umpire Bruce Oxenford but to no avail. With four to get off the final ball, Stokes bowled one well outside off stump for a wide to give Santner a second crack with two to tie and three to win. On the redo, Stokes missed his length going for a yorker and Santner responded by heaving a full delivery over the bowler's head to end the match and strengthen Super Kings' position at the top of the table, now four points clear of a trio sitting on eight points each. The home side scraped their way to 151 for 7 through a series of starts that were never converted. Eight of the nine batsmen who came to the crease reached double-digits, but none made more than the 28 from Stokes at No. 6 after they were sent in at the toss. Royals had decent momentum at the start of their innings having reached 31 for 0 in the third over before Deepak Chahar convinced Dhoni to review a not out decision on field with Ajinkya Rahane on 14. The ball appeared to be angling down leg initially but Dhoni finally signaled to go for the review on the brink of the 15-second cutoff. It proved to be a key moment as the replay showed the ball striking leg stump flush for the crucial third red to overturn the decision. It wound up ending the largest partnership of the innings. Only a late burst from Shreyas Gopal and 18 runs in the final over took Royals to a competitive total past 150. Contrary to the hot start from Royals, Super Kings got off to a miserable early reply. Shane Watson was bowled four balls into the chase with a beautiful delivery from Dhawal Kulkarni that held its line. Suresh Raina then committed a juvenile error loafing a single to fine leg as he watched Jofra Archer field, not expecting a throw to be sent to the non-striker's end where Archer had a direct hit with Raina a foot short to make it 5 for 2 in the second over. Faf du Plessis picked out one of the two boundary riders in the Powerplay at deep midwicket to gift Jaydev Unadkat a wicket in the fourth over. Stokes looked like he was making a bid for Man of the Match when he pulled off an early contender for catch of the tournament at backward point, flying to his left to knife Kedar Jadhav's attempted cut off Archer to make it 24 for 4 with one ball to go in the Powerplay. But the Super Kings captain flipped the script by combining with Ambati Rayudu for a 95-run stand. Momentum truly started to shift in the 10th over when Dhoni charged Gopal to loft him over long-on for six. He slog swept IPL debutant Riyan Parag in the following over to continue the counterattack before a third six off Gopal in the 13th. Until that point, Rayudu had been milking singles and twos but gained confidence from Dhoni's aggression and soon uncorked a sweetly driven six off Stokes in the 14th over. Rayudu brought up a 41-ball half-century before he fell in the 18th over, brilliantly caught by Gopal at deep midwicket off a Stokes slower ball. Dhoni fought off getting hit in the helmet by Archer in the 17th over to eventually bring up his 50 off 39 balls with a two behind point off Archer in the 19th over, after which he started sucking wind heavily. Another two required an extended break with the physio coming on the field while Dhoni caught his breath. A four flicked off his pads to end the 19th over brought the equation down to 18 off the final frame to set up the thrilling finish.